“Nat the cat is an expert sleeper…most of the time. In the morning, the humans in the family bump and clatter and honk and hurry, but from somewhere comes a snore. Who could that be? It’s Nat the orange tabby cat; he can apparently sleep anywhere. ‘Flopping halfway off a shelf, / Folded over on himself, // With his paws all tucked inside, / Or with limbs flung open wide— / Nat the cat can sleep like that!’ He can sleep through anything and almost anywhere—but when night comes and the house is quiet, Nat springs into action; he can never sleep through the night. And his humans probably don’t either, since Nat plays with someone’s toes in bed, races down a shadowy hallway and even rides a hobbyhorse. Canadians Allenby and Anderson have captured a cat any young ailurophile will recognize. The simple rhyming text listing the odd (yet realistic) places Nat can sleep during the daytime and all the silly mischief he and his black-and-white kitten sidekick get up to at night will hook young listeners. The watercolor, acrylic and pencil illustrations of floppy, goggle-eyed Nat and his buddy are a just-right pairing. 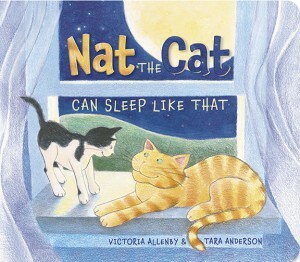 “In Nat the Cat Can Sleep Like That, author Victoria Allenby’s poetic text and illustrator Tara Anderson’s whimsical art lulls kids – and kitten – to sleep, making it a lovely bedtime read. “Tara Anderson’s illustrations are whimsical and fun…Although the illustrations complement the story, they also tell a story on their own, encouraging children, and children and their grownups, to read the story again and again. The mood of the book is playful, easily appealing to a preschool audience. Victoria Allenby’s title is a perfect choice for bedtime and storytimes for young children. “Nat the Cat can sleep through anything, even the antics of his rambunctious kitten housemate. He can also sleep in, on, or around anything, including a cooking pot, halfway off a shelf, and of course in the comfort of the window’s sunbeams. The pesky kitten does eventually interfere with Nat and his dreamland—naturally when the rest of the house is quiet—and the two friends engage in some energetic antics while avoiding what actually should be their bedtime. This rhyming story has a playful tone, great for reading aloud to preschoolers. The adorable illustrations by Tara Anderson, rendered primarily in pencil crayon, will appeal to the target audience a great deal, and may even inspire them to try their hand at similar drawings. The onomatopoeia in words like ‘whoosh,’ ‘shush’ and ‘hush’ further add to the light heartedness of the book, and will be fun for kids to imitate. “…The text is just right for little ones, and for those wanting to read books on their own. It evokes movement, and typical feline behaviors. The mixed media artwork (pencil crayon, watercolor, gouache, acrylics and glaze) adds charm and delight to the reading. The bright colors and textured images are sure to interest young listeners, while adding a parallel story to the one told in words.